AllegroMedical.com presents The Betancourt Nutrition L-Carnitine Concentrate - Grape Amino Acid Supplement. Transport Fat. Non-Stimulant Energy. Premium Grade Amino. Promotes Increases in Fat Oxidation and Energy Production. The Amino Acid Responsible for Metabolising Fat for Energy. 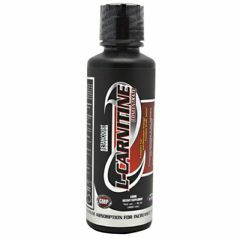 L-Carnitine Overview: L-Carnitine is formed from the amino acids L-Lysine and L-Methionine in the body for the purposes of fatty acid metabolism. Once fatty acids are transported to the mitochondria (the powerhouse centers of cells responsible for energy productions) They are converted to usable forms of energy. This is the reason L-Carnitine has been researched for its possible benefits in improving aerobic endurance, delaying fatigue, and improving fat utilization. Potential Beneftis of L-Carnitine Supplementation: L-Carnitine supplementation may aid in heart function and exercise tolerance. L-Carnitine is responsible for fatty acid metabolism. L-Carnitine supplementation may improve maximal exercise performance. L-Carnitine supplementation may support long-chain fatty acid metabolism. L-Carnitine may support heart cell health. L-Carnitine is essential in the conversion of fat to energy. L-Carnitine Concentrate is manufactured in a NSF certified GMP facility in Miami, Florida. This ensure thats our facilities comply with all Food and Drug Administration regulations and requirements for the manufacturing of nutritional supplements. Every single raw material used in our products is identity tested before production at a minimum and all finished products are submitted to rigorous quality control and assurance processes and procedures prior to being released to inventory. Guaranteeing the quality and safety of every bottle of Betancourt Nutrition product continues to be at the core of our business and our vision.